President Muhammadu Buhari has been reelected in Saturday's polls, but his main opposition rival is calling the results "rigged". The runner-up from the People's Democratic Party Atiku Abubakar says he'll challenge the outcome in court. Nigeria's courts have tended not to favour opposition parties in the past. Even as president Muhammadu Buhari calls for unity - some Nigerians are celebrating Buhari's win, while others are not very happy with the results. In Nigeria, unemployment and poverty are forcing many young people to turn to crime and they are tapping into the country's rich resources of oil. Africa's largest producer of crude oil is losing millions of dollars because of theft, but some locals say the illicit way is their only means of survival. Nigeria's electoral commission has declared incumbent Muhammadu Buhari the winner of the country's presidential elections. The announcement in the early hours of Wednesday means the 76-year-old has won a second four-year term at the helm of Africa's largest economy and most populous country. Hours after Buhari was declared winner, opposition leader Atiku Abubakar rejected the results and vowed a legal challenge. Buhari, of the ruling All Progressives Congress party, secured 56 percent, or 15.2m votes, in the February 23 polls, Mahmood Yakubu, chairman of the Independent National Electoral Commission (INEC), said. His main opponent, former vice president Abubakar of the People's Democratic Party (PDP), received 41 percent or 11.3m votes. "Muhammadu Buhari ... is hereby declared winner," Yakubu said. Hours after the announcement, Abubakar issued a statement rejecting the results. "It is clear that there were manifest and premeditated malpractices in many states which negate the results announced..." he said. "I hereby reject the result of the February 23, 2019, sham election and will be challenging it in court." The PDP has alleged electoral malpractice, including vote-rigging, in the polls, which were delayed by a week at the 11th hour. Buhari's party has said the opposition was trying to discredit the returns from Saturday's election. The candidate with the most votes nationwide is declared the winner as long as they have at least one-quarter of the vote in two-thirds of Nigeria's 36 states and the capital, Abuja. Otherwise, there is a second-round runoff. Buhari, 76, secured enough votes to meet both requirements. He took office in 2015 and sought a second term with pledges to fight corruption and overhaul Nigeria's ailing road and rail network. Atiku, 72, had said he would aim to double the size of the economy to $900bn by 2025, privatise the state oil company, and expand the role of the private sector. The vote - Africa's largest democratic exercise - was also marred by violence with at least 47 people killed since Saturday, according to the Situation Room, a monitoring organisation linking various civil society groups. Police have not yet provided official casualty figures. More than 260 people have been killed since the start of the election campaign in October. The toll so far is lower than in earlier elections, but the worst violence occurred previously only after results were announced. President Muhamadu Buhari has taken an early lead with 1.3 million votes. His closest challenger, former Vice President Atiku Abubakar has one-point-one million votes. The result could change as more results are expected to be tallied over night. Voting was extended to Sunday in several states to allow voters who were unable to vote on the election day late delivery of polling materials. Nigerian President Muhammadu Buhari held the edge in early election results that the main opposition party claimed were being manipulated following a vote marred by delays and at least 39 deaths. After results from 11 of Nigeria’s 36 states and the Federal Capital Territory, Buhari led his main challenger, Atiku Abubakar, by a 51 percent to 46 percent margin, according to data announced on Monday by the Independent National Electoral Commission in the capital, Abuja. The final vote tally is expected Tuesday or Wednesday. With his strong support in the northwest, the region with the greatest number of registered voters, Buhari’s prospects of winning re-election are bright, said Max Siollun, a Nigerian historian based in New York. The presidential and parliamentary election in Africa’s top oil producer was the continent’s biggest-ever democratic exercise. Almost 73 million people were eligible to vote Saturday in what analysts thought would be a tight race mainly between Buhari, an ex-general who campaigned on an anti-graft platform, and Abubakar, a 72-year-old businessman and former vice president. The chairman of Abubakar’s People’s Democratic Party, Uche Secondus, accused the government of using “inducements, manipulation and incarcerations” and enlisting the police and national army “to silence the voices of our long suffering people.” In a statement, he threatened to challenge some results. Buhari’s All Progressives Congress rejected the claims in a statement, accusing the PDP of trying to “discredit and destabilize” the electoral process. The election pitted two men of contrasting economic views, with Buhari, who favors a strong government role, against Abubakar, a pro-market multimillionaire who has said he would float the national currency and sell stakes in the state oil company. Wall Street banks such as Citigroup Inc. had said Nigerian equities and bonds will probably rally if Abubakar wins. The stock market closed up 0.6 percent in Lagos on Monday to extend its gains this year to 4 percent. At least 39 people were killed in election-related violence, Clement Nwankwo, the chairman of Situation Room, a monitoring group, told reporters Monday in Abuja. The inspector general of police, who didn’t give a death toll, said 128 people were arrested for offenses such as homicide and snatching of ballot boxes. INEC Chairman Mahmood Yakubu said an election worker was killed by a stray bullet in Rivers state. To win, a candidate must get the majority of votes and at least 25 percent in two-thirds of Nigeria’s 36 states and Federal Capital Territory. Otherwise, there’ll be a second round. While Buhari was likely to win in the north, Abubakar was expected to dominate in the south-east and south-south, two of Nigeria’s six so-called geopolitical zones, where Buhari has long been unpopular. The south-west, which includes the commercial capital of Lagos, and the north-central zones were potential swing areas. Abubakar’s PDP suffered an early blow when one of its highest-profile politicians, Senate President Bukola Saraki, lost his seat in the southwestern state of Kwara to the candidate from Buhari’s APC, according to INEC results. “Whilst the environment was tense and divisive, overall, fundamental freedoms of association, expression, assembly and movement were generally respected,” the chairman of the Commonwealth Observer Group, former Tanzanian President Jakaya Kikwete, told reporters in Abuja. Both Buhari and Abubakar are northern Muslims in a country split roughly evenly between a Christian south and Islamic north. Buhari ruled the country briefly as a dictator in the 1980s and morphed into a civilian politician who won on his fourth try for the presidency in 2015. Abubakar, who was vice president between 1999 and 2007, has business interests ranging from oil and gas services to food manufacturing and a private university. Buhari and his APC have faced sharp criticism for their handling of the economy. The president imposed capital controls as the naira currency came under pressure amid plunging revenue from oil, the country’s main export, and foreign investors fled. After a contraction in 2016, the economy expanded 1.9 percent last year, the fastest since Buhari’s election. Yet Nigeria now has more extremely poor people, 87 million, than any other nation, according to the Brookings Institution, a Washington-based think tank. The United Nations expects its population to double to 410 million by 2050, overtaking everywhere bar India and China. Buhari’s supporters paint him as an honest politician who provides a sharp counterpart to the PDP that governed Nigeria for 16 years from the end of military rule in 1999. Buhari’s suspension of Chief Justice Walter Onnoghen, accused of falsely declaring his assets, just weeks before the presidential election, was criticized by the legal community, the U.S. and the European Union, because the vote results may be contested in the Supreme Court. Abubakar portrays himself as someone who knows how to get things done and his pro-market policies have won some favor among investors. While he’s faced allegations of corruption, he denies any wrongdoing and has never been indicted at home or abroad. Vote-counting is under way in Nigeria after Saturday's presidential election. Incumbent President Muhammadu Buhari is seeking a second term, in what's thought to be a tight race with former Vice President Atiku Abubakar. The electoral commission extended voting hours in some places where polling stations opened late and ballot machines malfunctioned. Now, many Nigerians are watching election officials closely to make sure there is no vote-rigging. Emotions remain high and there are fears that a disputed result could lead to violence. As many as 39 people have died in election-related violence in Nigeria, as the country awaits the results of this weekend's voting in what is forecast to be its tightest poll since the end of military rule in 1999. He faces off against businessman Atiku Abubakar, 72, a former vice president who has promised to expand the role of the private sector. Nigeria's 73 million eligible voters chose from a pool of more than 70 presidential candidates, although only those from the two main parties — Mr Buhari and Mr Abubakar — are seen as having a chance. The President last year publicly denied social media claims he died and was replaced by a Sudanese clone, and also courted international controversy in the past by suggesting his wife "belongs in the kitchen". The Situation Room — which represents more than 70 civil society groups — gave Sunday's figure of 39 deaths, citing data from Lagos-based consultancy SBM Intelligence. In one incident, seven people were killed in a shootout between Nigerian army troops and a gang. Mahmood Yakubu, chairman of the Independent National Electoral Commission (INEC), said an electoral official had been shot dead by unknown people. The president's office declined to comment, while the opposition candidate Mr Abubakar condemned the violence in a statement. The number of deaths reported by Sunday was below the final death tolls in previous elections in Africa's most populous country, but in the past most unrest has taken place after results were announced. "From Tuesday onwards we should have a substantial number of results," said Festus Okoye, an election commission official. The contest between Mr Buhari and Mr Abubakar, commonly called "Atiku", hinges on revamping an economy struggling to recover from its first recession in 25 years, which it slipped into in 2016 and emerged from in 2017. In the run up to the Nigerian elections, the country has witnessed instances of fake news aimed at tarnishing the names of candidates, parties or even INEC. Negative use of social media has largely propagated the spread of fake news in Nigeria. But how can Nigerians tackle this? Campaign activities in Nigeria are expected to end at 12 midnight local time on Thursday. Nigeria's Independent National Electoral Commission set the extended deadline after elections due last weekend were postponed. Rescheduled polls are due to take place on Saturday, February 23rd. At least 59 "bandits" were killed by a civilian defence force when they attacked a village in northwest Nigeria, security officials and locals said. Local reports said the death toll could be even higher, after a local government official said 15 other bandits were killed in the nearby village of Danmarke, the AFP news agency reported on Thursday. "We killed 59 of the bandits and we lost seven men in the fight, which lasted for almost four hours," Bube Shehu, a resident of Danjibga village in Zamfara state, said of the clashes on Wednesday. Shehu's account was backed by a military officer in the state but there was no immediate corroboration from police. The worsening security situation in the northwest, President Muhammadu Buhari's strongest regional support base, is one of a number of challenges to his re-election, as voters go to the polls on Saturday. Farming and herding communities in the region have suffered increasing attacks from criminal gangs who raid villages, steal cattle and kidnap for ransom. The local official in Danmarke said villagers were frustrated at the lack of protection from security forces and had been forced to take matters into their own hands. "It is high time people stand up against criminals who attack their villages instead of succumbing to them," he said on condition of anonymity. Danjibga is a commercial hub 35km south of the state capital Gusau and has been repeatedly attacked. The attacks have led to a mass exodus of residents to the town of Tsafe, and even across into Buhari's home state of Katsina, which neighbours Zamfara. Earlier this month bandits killed 26 people when they raided seven villages in the Mada district, according to police. Last July, Amnesty International said Zamfara state was "at the mercy" of armed bandits who had killed at least 371 people in the first six months of 2018. In December, an influential traditional chief in the state urged authorities to allow vigilantes to carry assault rifles to defend themselves against bandits. Last month, Information Minister Lai Mohammed said bandits were mobilised to carry out attacks and "provoke massive chaos before, during and after the elections". Security is an election issue given Buhari's pledge in 2015 to improve safety across the country, not least end Boko Haram's armed campaign. Nigerian politicians and businesses have begun introducing measures to encourage people to vote in this weekend's rescheduled presidential and parliamentary elections. The country's electoral commission delayed the vote just five hours before polls were due to open across Nigeria last Saturday, citing "logistical reasons." Nigerians can only cast their ballots at polling units in the area where they initially registered, and as a result, there have been concerns over low voter turnout because people who traveled last week may be unwilling (or able to afford) to make another trip to their polling unit after a wasted journey last week. The Nigerian government has declared the eve of the elections a public holiday, with the exception of bankers and essential service providers. The holiday is to enable citizens prepare for the election, the Ministry of Interior said in a statement Wednesday, according to local media reports. "The work-free day is to enable citizens return to their polling units for the rescheduled Presidential and National Assembly elections," the statement read. Reno Omokri, an aide to former President Goodluck Jonathan and a stalwart of the main opposition party, People's Democratic Party (PDP), said he is offering free transportation to Nigerians in buses called "Buses for Democracy." The buses will ferry Nigerians to their various destinations regardless of their political affiliations, Omokri said in Twitter post. There have been additional reports of efforts made to help in the effort to rally voters ahead of the polls. Two local airlines have offered discounts to voters to boost turnout at the polls. Arik Air, a domestic carrier to several destinations around the country, introduced a "Fly to Vote" promotion with one-way tickets pegged at N16,000 (about $45). The airline says the initiative is to encourage people to vote in Saturday's elections and the state elections scheduled for March 9. Aero Contractors is offering a similar reduction in flight tickets on all its routes across the country. Reuters news agency also reported that fuel suppliers would cut the price of petrol, quoting the country's Information Minister, Lai Mohammed. However, local media reports say the various stakeholders involved in reducing fuel prices have yet to make such decision or indicate they are willing to. CNN was not immediately able to reach Mohammed for a comment to clarify. Nigerian President Muhammadu Buhari, 76, is standing for re-election and will be running against 71 other candidates for the country's highest office. His main challenger is Atiku Abubakar, 72, a business tycoon and former vice president. Last Saturday, 16 February, elections in Nigeria were halted just hours before polling had been due to get under way. It was a huge inconvenience for millions of Nigerians, many of whom had traveled long distances to vote. The poll will now be held a week later, on Saturday, 23 February. With the extra time to prepare, are things now in place for the vote? Why was the poll postponed? Both the main parties, the governing All Peoples Congress (APC) and the People's Democratic Party (PDP), condemned the delay and blamed each other for meddling in the elections. This isn't the first time voters in Nigeria have been left in the lurch. It happened in the two previous presidential elections, in 2011 and 2015, and has led many to question the competence of the organising body, the Independent National Electoral Commission (Inec). Some of the issues cited are not within the powers of the electoral commission to control, such as the unpredictable nature of Nigeria's weather. But there are clearly other logistical factors that do need to be addressed if the election is to proceed smoothly. Each of the 84 millions registered voters in Nigeria is required to bring a Permanent Voting Card (PVC), which is then verified at the polling station using a smart card reader. However, many potential voters haven't got PVCs - and the electoral commission itself says 11 million of the cards printed haven't been collected. That's a big shortfall and won't be rectified by polling day - meaning millions of registered voters won't be able to cast ballots. Then there are the machines used to verify voters - 180,000 smart card readers have been deployed to polling stations across the country. All these machines were initially programmed to work on the originally planned voting day only, so they have all needed to be reprogrammed. Inec says this process has been completed and the machines are ready for use. It also says it has made up for 4,600 smart card readers destroyed in a fire in Anambra State, by redistributing devices from other states - although that may leave fewer back-up machines for polling stations in other regions. Organising elections in Nigeria is a huge logistical challenge. It's a large country, with an estimated 200 million people, and many regions lack proper roads and infrastructure. The electoral commission says ballot papers and election staff will be in place across the country. Sensitive election materials such as ballot papers and result sheets are being held in local central banks, Inec has told BBC News. However, reports from local media have highlighted further logistical mishaps and the destruction of election materials and resources. Some election material has even been found in the wrong states. Election officials are working with security forces to prevent disruption to the election. Inec maintains voting will take place in all 774 local government areas. And international election observers say it has been moving in the right direction..
"I think Inec have definitely picked up their game," says John Tomaszewski, the International Republican Institute's regional director for Africa. In Borno State, in north-eastern Nigeria, the state most affected by Boko Haram Islamist militants, eight local government areas have prepared satellite polling stations in camps for internally displaced people. But last week, in the run-up to the originally planned election day, Boko Haram coordinated a series of attacks and suicide bombings on military bases and a neighbourhood in the north-eastern city of Maiduguri. And Idayat Hassan, from Abuja-based think tank the Centre for Democracy and Development, says: "The likelihood of Boko Haram attacking during the elections is high - the insurgents have consistently express aversion towards democracy and elections." Meanwhile, in other states, such as Zamfara, in northern-most Nigeria, kidnappings, killings and general lawlessness are also raising voters' fears. Video - Is democracy the answer to Nigeria's woes? Millions of Nigerians finally get to vote for a new leader on Saturday after the election was postponed by a week. Whoever wins will have to address at least three pressing issues, the sluggish economy, security problems and corruption. It's expected to be a tight race between President Muhammadu Buhari, who is seeking a second term, and Atiku Abubakar the main opposition candidate. Buhari has promised to fight corruption but his opponents have focused on what they say has been his failure to fix the economy. The main contenders made their final appeal for votes on the last day of campaigning on Thursday. So, will elections make any difference? It is the battle for the youth's vote in Nigeria. Young Nigerians make up the biggest voting bloc in the pivotal presidential and National Assembly elections, which begin on Saturday. Meanwhile, Nigeria's Foreign Affairs minister has warned international envoys against interfering in the re-scheduled elections. Geoffrey Onyeama was briefing diplomats ahead of Saturdays polls, in which Nigerians will vote for their next president, and law makers. Well, Nigeria's Independent National Electoral Commission, has assured citizens and the international community that the election on Saturday will be smooth. Political parties have also been allowed to resume campaigns in the remaining days, as stipulated by the electoral act. Video - Will voters punish Buhari for not tackling Nigeria's oil spills? Nigeria's President Muhammadu Buhari came to power with a promise to clean up the Niger Delta. But as he seeks re-election, it is still a mess of oil spills, causing sickness in surrounding villages and destroying people's livelihoods. It's been a hectic week for Nigeria's media. Carefully laid out plans to cover elections in Africa's largest democracy were scuttled at the eleventh hour after polls were postponed by a week. And while some of the coverage has come into sharp focus for its objectivity or lack of it, the media has made huge strides in recent years. Still in Nigeria...Businesses in major cities are making steep loses, as most Nigerians retreat to rural areas to vote in the Saturday election. Most businesses closed shop over the weekend. But the few that opened struggled to get customers. In Nigeria, dozens of first-time female candidates are seeking victory in the re-scheduled election. The women have gone as far as creating a Whatsapp group where they are urging and encouraging each other to stay focused. The country's percentage of women in parliament is one of the lowest in the world. But this group of female politicians are eager to prove that they can make equally good leaders. Okiti Erhovwo, a physiologist and relationship coach, planned his wedding for March 9 after considering the scheduled dates of the general elections. The presidential and legislative elections were to take place on February 16 and the state governorship on March 2. But the postponement announced on Saturday of the governorship election to March 9 has forced him to cancel his marriage ceremony. "It's disheartening, to say, the least that after making preparations and putting logistics in a place for our wedding ... elections have been postponed to the same wedding date. It's devastating. So sad," Erhovwo told Al Jazeera. Besides dealing with the disappointment, he now has to make new arrangements to marry his fiance, Eminence Agbechoma, who took the announcement even harder. "There's no one that would be excited at such sudden news. She felt sad, the family felt sad. But our hope is that God will do that which he, God, has set out to do and he that started this good work would surely complete it," Erhovwo said. The Independent National Electoral Commission (INEC) announced the postponement of polls early Saturday following an emergency meeting in the capital, Abuja. INEC said it needed more time to ensure a free and fair vote. Many Nigerians who stayed up late to follow proceedings were angered by the decision. Social media has become a platform to complain about the economic implications of the vote delay by a week. Voters can only cast their ballots in places where they are registered by INEC, or they must seek a transfer to their preferred voting centres. Some Nigerians travelled hundreds of kilometres to vote and the postponement - just a few hours prior to the opening of the polls - has left some stranded. Despite the inconvenience, some Nigerians are willing to pay the travel costs again. "For us, this election is very crucial and people want to demonstrate their faith in democracy by participating in deciding their future," businessman Pascal Metuh told Al Jazeera. Some businesses and offices are still shut. "This is a loss of business to the economy, which is not good news for economic performance," economist Aliyu Audu told Al Jazeera. "The effects will be felt in the short term by businesses' loss of revenue until the economy picks up after the election," Audu said. Some who had to reschedule their plans are also worried about extra costs incurred by the delay. "It's certainly going to have a grave economic implication considering the fact that initial logistics that have been made took swell sums of money," lamented Erhovwo, the husband-to-be. "And due to the sudden election postponement - which coincided with the wedding date - money has to be made available again for those logistics in preparation for a new date." Nigerians are never quick to demand any form of compensation from the government when policy changes cause them financial losses. "I wouldn't consider any form of compensation from INEC because this thing is not just about money. A whole lot has been invested into the planning. Would they also compensate for the mental resources and time that went into the planning? Of course not," Erhovwo said. The ruling All Progressives Congress and the main opposition Peoples Democratic Party have both criticised the delay. In 2007, Musa Yar’Adua was elected president of Nigeria in an election so flawed, one of his major actions as president was pushing for electoral reforms. To his credit, due to progress made since, an election like that of 2007 (described as “a charade” by election observers) is unlikely today. And a major reason is INEC, Nigeria’s electoral commission, has embraced technology. While Nigeria’s elections are by no means fully electronic, the use of permanent voter cards (PVC) verified by electronic card readers to accredit voters has proven a major leap. Under the current system, voters show up at polling units and have their PVC verified by card readers before being allowed to vote. The two-step authentication eliminates the dual problems of impersonation and multiple voting—previously rampant rigging tactics. It’s a major shift from the past when only paperwork (which could easily be faked) was enough to allow voters cast a ballot. “The smart card readers and PVCs were a very important innovation that really enhanced the credibility of the elections,” says Richard Klein, senior adviser for elections at the National Democratic Institute (NDI). As Quartz Africa has reported, improvements in making elections more secure have forced politicians to rethink their campaign tactics to reach and convince voters directly. INEC, which is going through its latest credibility test after delaying the presidential election by a week with a few hours to the polls opening on Feb. 16, has taken steps to protect its current set-up. This includes programming the card readers to work only at specific locations and during specific time frames on election day, which will now be Saturday Feb. 23. To reduce the likelihood of a hack, the card readers are also programmed to only transmit data without receiving any during the polls. The commission has also proven proactive in solving any card reader-related problems. Eyitemi Egbejule, a cyber-security consultant, who worked on card reader tests as a third party consultant before they debuted in the 2015 election says INEC fixed all identified security issues before the elections. The commission has since upgraded the system ahead of this year’s elections. Despite major progress, INEC’s processes remain far from perfect. The commission’s technology could ultimately be undermined by its people if electoral officials abandon the card readers on election day as a result of intimidation by party agents or in a bid to speed up voting, Klein says. It’s a red flag that election observers will keenly watch out for. The process of collation of results, still done manually, is also a weakness along the value chain and is susceptible to manipulation, Klein adds. There are also transparency concerns under INEC’s current system as it has not yet announced the total number of collected PVCs, despite calls from civic society groups to do so. Political parties and actors in Nigeria are still trying to game the system too: vote buying tactics—offering money or food as inducements for votes on election day—have become more brazen. One Lagos taxi driver, who asked not be named, described how he was been offered a 1,000 naira (~$3) mobile phone card to get his vote, during the last presidential election. Then there’s also the fear of possible voter suppression and intimidation by party agents in their opponents’ strongholds. The postponement of elections also shows INEC remains unable to solve its long-running logistical problems. But observers believe there’s a silver lining: INEC’s deliberate choice to distribute voting materials at the last possible moment is seen as part of its commitment to secure the elections. But even though the lingering problems remain, Klein, a veteran observer of national polls in Nigeria since 2003, insists elections “are much better today.” As he puts it, the question isn’t so much as to whether Nigeria has a good electoral system, it’s whether the procedures that secure the elections will actually be followed on election day. Nigeria is to hold a delayed presidential election this Saturday after the initial vote was rescheduled in a dramatic overnight press conference, five hours before polls were due to have opened. The governing All Progressives Congress (APC) and its main challenger, the People's Democratic Party (PDP), have both condemned the postponement and accused each other of trying to manipulate the vote. In a statement issued on the day of the postponement, the APC alleged the PDP wanted to halt the momentum of its candidate, President Muhammadu Buhari. The PDP, whose presidential contender is Atiku Abubakar, on the other hand said Inec had delayed the election to create "the space to perfect their rigging plans". She compares the latest postponement to the one in 2015, when the PDP - in government at the time - pushed the election back by six weeks, blaming the Boko Haram insurgency in the north-east. That postponement, she says, ended up favouring the APC because it cast the PDP in a negative light - as a party that would pursue "power at all costs". She believes this year's delay could slightly benefit the APC as it would increase voter apathy in most areas except those with historically high turnouts - "the north-west and the north-east... both strongholds of President Muhammadu Buhari". Another view holds that the delay will harm Mr Buhari's chances, as the electoral commission's un-readiness reflects poorly on him. The commission's chief, Mahmood Yakubu, was appointed by Mr Buhari in 2015. Inec says there will be no further delays, but some observers have questioned whether the elections will go ahead on 23 February. Festus Mogae, a former president of Botswana, told the BBC's Newsday programme that he was doubtful that all the preparations would be completed. "It's a great deal of work yet to be done," the head of the international election observation mission said. "I don't know whether that can be managed or not, I am not in a position to judge but it makes me apprehensive." "One has to be realistic given the enormity of the activities that are supposed to be taken care of," she said. As well as overcoming logistical hurdles, she said popular enthusiasm for the electoral process would have to be restored to where it was until last week's cancellation. For Inec, keeping to the new date is central to maintaining the public's trust. Alhaji Yahaya Bello, the resident electoral commissioner for the capital, Abuja, told the BBC there would be "pandemonium" if election materials were not deployed in time. "People will just think that Inec has hidden them deliberately, so we can dock some of the results," he said. The first task is to reconfigure some 180,000 card readers that are being used to validate voters' identity cards and check their biometric details. The dates on the readers need to be changed to the new election date. In a statement, Inec said this process would take five to six days, and is due to be completed by Thursday 21 February. Election staff, including an estimated one million so-called ad-hoc staff, will also be travelling then. It is unclear what happened to the staff and volunteers, including members of the country's youth corps, that had already been deployed last Friday. Nigeria's internal conflicts have displaced nearly 2 million people, according to the United Nations, with 60 percent of them being children. A program in the Nigerian capital is trying to teach internally displaced children technology skills, including computer coding, with a mobile laboratory. Twelve-year-old Michael Oladimeji fled with his family from Nigeria’s Borno State two years ago to escape Boko Haram terrorist attacks. Over 10,000 people are living in camps in Abuja struggling for food, water, health care and education. But Oladimeji was lucky - he became one of 100 students his age learning computer coding and animation at a mobile laboratory. The tech curriculum includes writing code with a program known as Scratch. "At home I used to play with my daddy's phone but it's not enough for me to do my coding and to do my Scratch. So since we started this program, I've got the chance to do Scratch and make cartoons,” Oladimeji said. Children like Oladimeji make up the majority of Nigeria's 1.8 million displaced people. But Nigeria's Civic Innovation Lab – a technology hub - runs the initiative, which is shaping children's futures, according to program facilitator Angu Kingsley. "Judging from where they came from, they have little knowledge about computers and education generally. So what we're trying to do is improve on what they already have, the knowledge they already have and build on it,” Kingsley said. While only a hundred or so displaced kids have benefited so far, the project hopes to expand – if it can secure funding, says program head Fanto Foday. "We only have few tablets and few computers so we've been having difficulties in the areas of giving assignment because when we leave we have to take the equipment, although the truck is there, they have access to the lab but they don't really have access to the gadgets,” Foday said. But for conflict-displaced students like Oladimeji, the chance to learn computer coding could be a game-changer. Towns and cities across Nigeria are slowly coming back to life as Nigerians prepare for the working week ahead of the re-scheduled polls. But there are concerns that there will be a low voter turnout. Political parties are, however, urging their supporters to turn up in large numbers and vote on February the 23rd. Nigeria's Independent National Electoral Commission is appealing to voters to trust in its ability to conduct a free, fair and credible election. After an extensive meeting with stake-holders in the nation's capital Abuja, the commission clarified its decision to postpone the general elections by one week. Religious violence between Christians and Muslims is also a concern ahead of Saturday's vote in Nigeria. Officials in the northwest have discovered the bodies of 66 people killed by what they are calling "criminal elements". The remains of 22 children were among those found in eight villages in the Kajuru area of Kaduna state. Security forces say they have already made some arrests. Fires, possible sabotage and logistical challenges are being blamed for Nigeria's election being pushed back. A last-minute decision to postpone the ballot by one week caught everyone, from voters to candidates, off guard. The Electoral Commission says many states simply were not ready to hold the election, and more time was needed to ensure the elections were free, fair and credible. The postponement of elections in Nigeria has been a major inconvenience for millions of voters, especially those who have taken long and expensive journeys to cast their ballots. On Saturday, the election commission decided to delay polls for a week, saying it needs more time to ensure a free and fair vote. But there are concerns that the decision could lead to a low turnout. Some of Nigeria's leading presidential candidates have condemned the decision to postpone elections by a week. Many have blamed each other for the delay, announced by the election commission hours before polls were due to open. There is also growing concern about the economic effect. There's a twist to the story of an attack that reportedly claimed over 60 lives in some communities in Kaduna State, in the northwest of the country. Authorities said 66 people were killed by unknown gunmen in Kajuru on Friday night. Among the dead were 22 women and 12 children. But some of the residents are telling a different story. Nigerian stocks fell the most in more than five months and bond yields rose after Africa’s biggest oil producer delayed last weekend’s presidential and parliamentary election at the last minute. The one-week postponement, just a few hours before voting was scheduled to start on Saturday morning, rattled investors and led to accusations from both President Muhammadu Buhari’s party and the opposition, led by Atiku Abubakar, of skulduggery against one another. Nigeria’s stock benchmark dropped 2.5 percent by 1.30 p.m. in Lagos, the commercial capital, the most among major indexes globally and its biggest fall since Sept. 12. Dangote Cement Plc, owned by billionaire Aliko Dangote and the largest company on the bourse, lost 3.6 percent. Yields on the government’s $1.5 billion Eurobond maturing in November 2027 rose 7 basis points to 7.19 percent. Nigerian assets had rallied since the end of January on the expectation of a smooth election. The Independent National Electoral Commission’s delay marked the third consecutive time that Nigeria has postponed a nationwide vote. A week before the 2015 ballot, it was moved back by more than a month. Buhari went on to win and become the first opposition candidate to take power in Africa’s biggest oil producer. As well as pushing back the presidential and parliamentary vote to Feb. 23, INEC delayed governorship elections for a week until March 9. The chairman of Buhari’s All Progressives Congress, Adams Oshiomhole, said INEC had colluded with the Abubakar’s People’s Democratic Party over the delay. An INEC spokesman, Rotimi Oyekanmi, denied any party had been informed in advance. Abubakar, a 72-year-old businessman and ex-vice president, said there was a plot by the government to rig the election by stifling voter turnout in areas where he needs big majorities to win. An INEC spokesman didn’t immediately respond to the comments by Buhari and Oshiomhole. But its chairman, Mahmood Yakubu, said Sunday the delay was because of logistical problems and had nothing to do with political interference or security concerns. Election officials and members of the national youth corps were left stranded across the country. Many Nigerians had traveled to their hometowns to vote and won’t be able to afford a trip for a second weekend running. Nigerian assets may recover later in the week if investors think the delay won’t be repeated or lead to violence, according to Aderonke Akinsola, an analyst at Chapel Hill Denham, an investment bank in Lagos. Video - Why aren't more women in politics in Nigeria? Nigeria is Africa’s largest democracy but has one of the lowest percentages of female political representation on the continent. Women make up less than 6 percent of the country’s parliament, according to the International Parliamentary Union, and no Nigerian woman has ever been elected president, vice president or governor. Women aspiring to become politicians often encounter a lack of support from a society that is conservative and patriarchal. Some have even experienced gender-based election harassment and violence. Out of more than 70 candidates, six women ran for president this year. The most well-known female candidate, Oby Ezekwesili - a former education minister and Bring Back Our Girls campaign co-founder - withdrew from the race last month to support an opposition coalition. What should be done to increase women's participation in government, and to what extent is gender equality an issue in this year’s election? In this episode, we’ll learn about the experiences of Nigerian women trying to make it in politics and hear their views on the country’s upcoming election. The youth vote is likely to play a major part in Nigeria's presidential and parliamentary elections on Saturday. Jobs are increasingly scarce and the cost of living is rising, leading to frustration among this younger generation. Al Jazeera's Haru Mutasa met young people in the capital Abuja, who are hoping for change. Ahead of Nigeria's presidential election scheduled for Saturday 16th February, the two main candidates Muhammadu Buhari and Atiku Abubakar signed a peace accord on Wednesday. They both pledged to accept the result of the poll as announced by INEC, and to be ambassadors of peace in the country. But just how important is the accord to Nigerians? The campaign to elect Nigeria's next president is drawing to a close with accusations flying over the abuse of social media to spread misleading information. Both of the main political parties have told BBC Reality Check their rivals are involved in the spread of disinformation. The incumbent president, Muhammadu Buhari, of the All Progressives Congress (APC), and his main rival, Atiku Abubakar, running for the People's Democratic Party (PDP), have both been the target of videos containing dubious or inaccurate information, being shared online. "There has been some efforts by the PDP campaign to push disinformation," says Tolu Ogunlesi, head of digital communications for President Buhari. Both parties deny any knowledge of people inside the party spreading disinformation. "The APC is predicated on propaganda - they have manipulated pictures and words," says Paul Ibe, a media adviser to Mr Abubakar. The APC denies the accusations and attacks the PDP for spreading lies. "Political parties support and encourage the dissemination of divisive 'fake news' on their behalf but have little control over its development and spread," according to Jonathan Fisher, who is overseeing a project looking at the role of WhatsApp in Nigeria's elections. Written posts, photos and videos have been shared on social media platforms, publicly on Facebook and in private WhatsApp groups, spreading unsubstantiated rumours about the candidates. One of the most prominent is that a double is standing in for President Buhari at public events, which he has repeatedly and firmly denied. Here is a round-up from Reality Check of some of the false rumours and misleading information spread against the two men vying to become Nigeria's next president. One example of disinformation, which started to appear on social media a few days ago, has been about Leah Sharibu, a 15-year-old held captive for nearly a year by Islamist militants Boko Haram for refusing to convert to Islam. More than 100 girls were kidnapped from the village of Dapchi, in northern Nigeria, and all but one have now been released. The messages and posts, spread on WhatsApp and Facebook, claimed that Leah had died - and they quickly went viral. An anonymous "family source" had confirmed the death of the girl, according to social media posts. In response, a government minister called the story "absolute fake news" and Mr Ogunlesi, from Mr Buhari's campaign, says the story was used to deliberately target the government. The accusation here is that opposition candidate Atiku Abubakar was behind a ploy to hand out cash and food boxes at a political rally. This story was shared online by an aide to President Buhari, who posted a photo of boxes wrapped together with Nigerian currency notes in the northern state of Sokoto. "Keep them in poverty, then give them handouts - Atiku in Sokoto yesterday," she wrote. The Buhari campaign denies spreading any disinformation. However, the photo is two years old and was taken at an event organised by the Kokun Foundation, which campaigns against hunger. A media adviser for the Atiku campaign told BBC Reality Check: "Atiku will not give handouts to anybody." Another widely shared video accuses Atiku Abubakar of brokering a deal with Boko Haram in exchange for land and oil. The short video, viewed over 200,000 times, was shared from a Facebook page called "Make Nigeria Worse Again". But it has no details about where or when the Atiku campaign was supposed to have announced the plan. The Atiku campaign team told BBC Reality Check that the deal did not exist - "there is nothing to that affect". And finally, we've turned up an inaccurate story doing the rounds online portraying Muhammadu Buhari as both unpatriotic and bestowing favours on a member of his own ethnic group when he was military head of state in the 1980s. This would be potentially damaging to Mr Buhari's attempt to appeal to all Nigerians, not just those from his own region. The story relates to Mr Buhari's failure to support the election of a Nigerian candidate for the post of secretary general of the Organisation of African Unity, the precursor of the African Union (AU). Instead, the story goes, he supported a non-Nigerian from the neighbouring country of Niger - where a member of his own Fulani ethnic group was a candidate for the job. This story has been repeatedly and emphatically rejected by the president's spokesman, Garba Shehu. Uche Secondus, the chairman of the opposition People's Democratic Party, told a news conference in the capital, Abuja, on Thursday that the electoral commission "did not in fact do a cleanup of the register of voters" before publishing it. He also alleged "a coordinated approach to register foreigners" as voters. The People's Democratic Party, whose presidential candidate is Atiku Abubakar, is Nigeria's main opposition party. 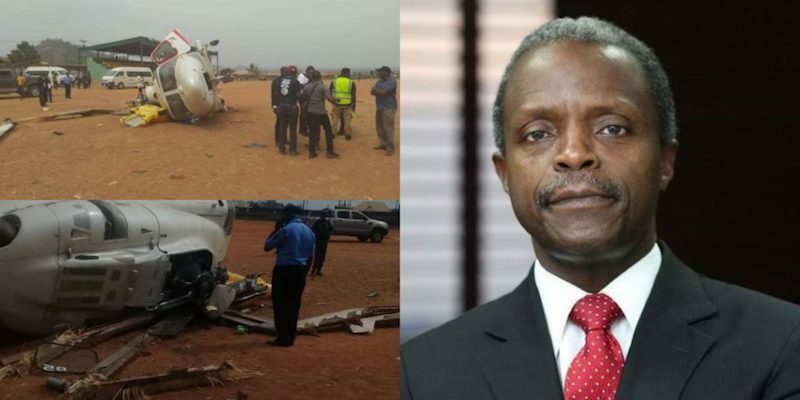 The helicopter of Nigeria's vice president crash-landed but he and the crew are safe, a spokesman said on Saturday. Laolu Akande in a Twitter post said Vice President Yemi Osinbajo was "continuing with his engagements and plans for the day" after the crash in Kabba in Kogi state. Akande gave no further details on the crash but he thanked God and the flight crew. Local media outlet Sahara Reporters published photos of a helicopter on its side, its rotor blades smashed. "We are safe and sound!" Osinbajo tweeted, saying the crew managed the situation well. He linked to a video of himself appeared unscathed and waving to supporters from a vehicle. Akande later said the vice president told a crowd that "we are extremely grateful to the Lord for preserving our lives." Nigeria's presidential election is on February 16 and President Muhammadu Buhari seeks a second term. In a bid to diversify its economy following the 2016 recession, Nigeria is looking to boost its manufacturing capabilities. The "business hub" of Africa, Nigeria is home to the continent's biggest population and biggest economy. But the challenge lies in convincing Nigerians to pick locally made products over imported goods. One firm trying to build its brand is food and beverage manufacturer Rite Foods. The company has a factory located three hours outside Lagos, where it makes a range of soft drinks, mineral water and snacks like sausage rolls. "If anything, being a Nigerian-owned brand initially would almost become a negative, because people think that what is produced locally just can't be as good, but what we've been able to do in the last 28 months is to show that no, actually you can be a proud Nigerian brand," Rite Foods' managing director Seleem Adegunwa told the BBC. But manufacturing in the country comes with a whole host of other challenges as well. "Everything is a challenge. You have to produce the power [to run the plant] yourself, because you're not on the grid," explained Mr Adegunwa. And then there's gaining access to markets. In 2015, African consumers spent an estimated $1.4 trillion (£1.1tn), according to research firm McKinsey, and by 2025, consumer spending is expected to top $2tn (£1.5tn). South Africa, Nigeria and Egypt made up more than half of that total. Nigeria is home to 200 million people, and its consumer market is estimated to be worth $150bn, which means there's a lot of potential for growth, although there is stiff competition from international brands both in the continent and abroad. "Nigeria just came out of a recession, and after the recession there were some adjustment policies that took place. The currency lost about 60% of its value," finance expert Bismarck Rewane told the BBC. "All of this has made homemade goods much more competitive than imported goods, so people will have taken advantage of the currency value, the size of the market, the changing demographic and the fact that there is growth taking place after six quarters of negative growth."